Today marks the debut of a new character for Borderlands 2, but it also marks the first official confirmation of when the game's next DLC addition might appear. Generally speaking, financial reports are a very dull affair. I get paid good money to pore over them, and still spend most of those precious minutes coming up with increasingly efficient ways to splatter my brain across the wall behind me. Still, this rule doesn't always hold true, and publisher Take Two Interactive is a very good example of this. The company's latest financial report appeared mere hours ago and amid all the boring numbers, Take Two inserted a bit of interesting info. Most notably, word on when we can expect Tiny Tina's Assault On Dragon Keep. In case you're unfamiliar with who Tiny Tina is, a quick refresher: Borderlands 2 is a game whose writing relies very heavily on memes and other forms of lazy internet humor, and Tiny Tina is the hyperactive, foul-mouthed epitome of this effort. Whether that's a positive or not hinges on how you feel about all that stuff I just decried, but regardless of your thoughts, Tiny Tina is star in her own upcoming DLC pack. Unlike Krieg, the character released today for Borderlands 2, Tiny Tina's DLC pack is less "new character" and more "bushel of new content," so that's something to be psyched for, no? Now that you're up to speed (and likely raging against me for jabbing at your favorite game), on to the crucial bit: According to 2K Games, Tiny Tina's Assault On Dragon Keep is scheduled for release on the Xbox 360, PlayStation 3 and PC platforms on June 25. There's no solid pricing info, but if we're to base a guess on recent history, it seems likely that the DLC pack will be priced somewhere between $10 and $15. Now, who wants to be the first to question my mother's sexual proclivities? I know it's coming - after all, I did insult a fictional character, and that's borderline sacrilege 'round these parts. 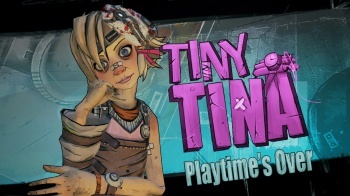 Edit: Initially this article claimed Tiny Tina would be a playable character in the imminent DLC pack. This may or may not be true, but for the sake of clarity, it's best we assume for now that she's a mere non-player character. We apologize for the confusion and have amended this article to reflect our current reality.